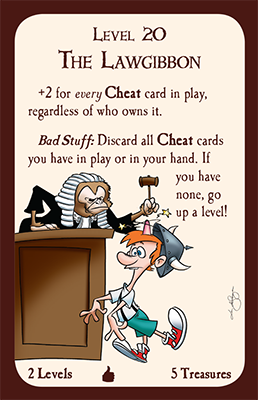 Daily Illuminator: Keep An Ace In The Hole With Munchkin Cheats! May 14, 2018: Keep An Ace In The Hole With Munchkin Cheats! When we ask people what they like to do in Munchkin, we get one answer more than anything else: Cheat. Since real cheating is discouraged, we've created a new mini-expansion of cards dedicated to the underhanded arts. 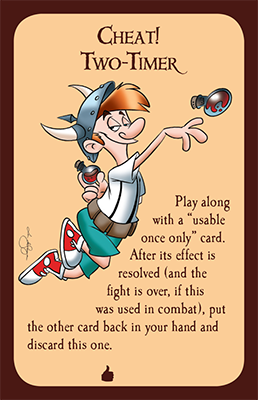 Munchkin Cheats gives players even more ways to play additional treasures and get an upper hand on the opponents. But watch out! It also includes new Monsters and Curses to punish those dirty, rotten cheaters. We've got a couple of preview cards, including some of the amazing new art from Lar DeSouza (Super Munchkin Guest Artist Edition, Munchkin Collectible Card Game). He gives some of the classic Munchkin characters his own twist! Look for Munchkin Cheats at your local game store this June, and remember to cheat with both hands!